Dear Friends for Life: The war against babies with Down’s syndrome continues to widen. The latest headlines read: “New prenatal test for Down’s eugenics by the back door?” The killing by abortion of these beautiful babies has increased as a newer and more accurate prenatal test for Down’s syndrome was developed in Britain. Pro-life campaigners fear this is eugenics by the back door. They have warned that because most people terminate pregnancies where Down’s syndrome is identified, this accurate form of testing will result in the disappearance of people with this condition. It is important to remember that a baby is a baby first and foremost and that the syndrome is very much secondary. This little baby is a real baby. It is precious. It is beautiful as all new babies are and has the exact same needs. Some parents cope better than others in caring for any new baby. In this case it is a question whether the baby has a disability or not. A baby with Down syndrome is not the fault of the mother or father. It is the result of a chromosomal problem. Therefore a baby comes first and the diagnosis second. Parents should celebrate their baby’s birth just as they would any other baby. 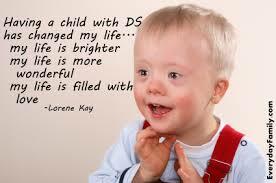 Searching on the web, I find that such reactions are the majority among parents who have a child with Down syndrome. Yet Wikipedia reports that about 92% of pregnancies in Europe with a diagnosis of Down syndrome are terminated by abortion. In the United States, the killing-by-abortion rates are around 67%. Shock Report Shows 98% of Babies With Down Syndrome are Aborted in Denmark. Across the world the percentage is very high and continues to increase at an alarming rate as new and more accurate tests are developed. Most human beings are outraged at the thought of a person being discriminated against because of a disability. Why, then, should we accept such discrimination when it happens in the womb? 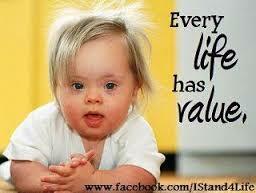 Every life has a value. Every human life is a beautiful gift from God. Children with Down syndrome are gifts from God. They have a basic HUMAN RIGHT TO LIFE. They lead fulfilling lives, inspire sweeping acts of love and totally depend on us. Part of society seeks to dismiss them as ‘imperfect,’ but they deserve the same chance at life as any other unborn child. The Catholic Church proclaims that human life is sacred and that the dignity of the human person is the foundation of a moral vision for society. This belief is the foundation of all its principles on social teaching. All people are sacred, made in the image and likeness of God. People do not lose dignity because of disability, poverty, age, lack of success, or race. This principle should be the foundation for society’s promotion of respect for human life.